I’ve changed my 2018 budget to better suit my needs. These changes were necessary because my circumstances are constantly evolving. I usually do an overhaul of my budget at the beginning of each year. This may range from making very large changes to simply tweaking small items. In any case it is always a good idea to take a look at your budget annually to make changes. In this year’s budget the biggest changed was the Tuition category. I am increasing the category amount in Mint on a monthly basis. In the past I had the category set only as the tuition loan repayment amount. This means that when I paid tuition I would be over the allocated amount in my budget. At the end of the year I was always showing as having gone over the budget and this caused a bit of mental anxiety. Now, by including a buffer for tuition paid, I can roll over the extra amount and it will balance out at the end of the year. I know this is a psychological fix but it suits my needs at the moment. The next item I changed when I changed my 2018 budget is food and household. In the past, I had those as two separate categories, then I grouped them together some years. Then I separated eating out from regular groceries, which were combined with non-food items. I am going back to separating Food from Household (Non-food) items. If I can see the spending on those two categories I think it will allow to better control my spending. Another category I changed is the Rent category. My rent ends up being a number that ends in ‘8’ and I had this exact amount in my budget. The issue with this is that I don’t like seeing numbers that do not end in ‘5’ or ‘0’ in my budget. I know this is a not a big issue but it bothers me. I changed the category amount to end in ‘0’. This means that there will be a difference of $2 at the end of every month in the budget. This is a tiny amount which I will simply allow to roll over in Mint. Most of my other categories remained the same as last year. I did not need to change any other categories so the budget will remain this way until something major happens and I need to tweak it again. 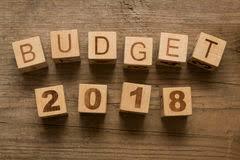 Did you make any changes to your budget this year? Share it in the comments!!! I always go through and make adjustments to our spending goals at the end of each year. Budgeting isn’t always fun but is definitely necessary. Here’s to a happy and prosperous 2018. That’s a great idea Money Beagle. All the best for 2018 to you too!